Get the latest StepNpull news & stories from blog posts, customer highlights, videos and more. Keep up date with our most recent blog posts and explore our YouTube videos below. Be sure to connect with us on social media so you know what the team is up to next. Car Dealership in Canada Recognized As 2018 #1 Best Restroom In Canada With The Help Of Missouri-Made Product; StepNpull. Submit a quick and easy form notifying StepNpull to contact a facility you recommend. Refer your favorite retail, restaurant, healthcare, manufacturing or public facility. Avoid germs, prevent cross-contamination, open the door when your hands are full, and reduce costs when paired with an efficient hand dryer. 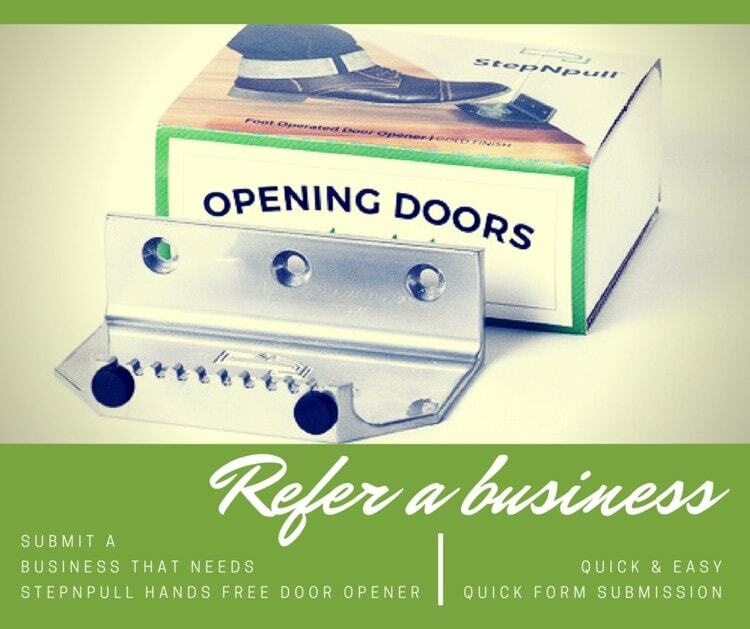 The StepNpull hands-free and foot-operated door opener is an instant infection prevention strategy that can be implemented on any latch-less commercial wood or metal door. Our product is the origional low-cost and effective way to ensure your customers have a germ-free and sanitary way to exit a restroom or door. Simply step and pull, it's that easy!